Hello! This is my first guide and im happy to be sharing it with you all. 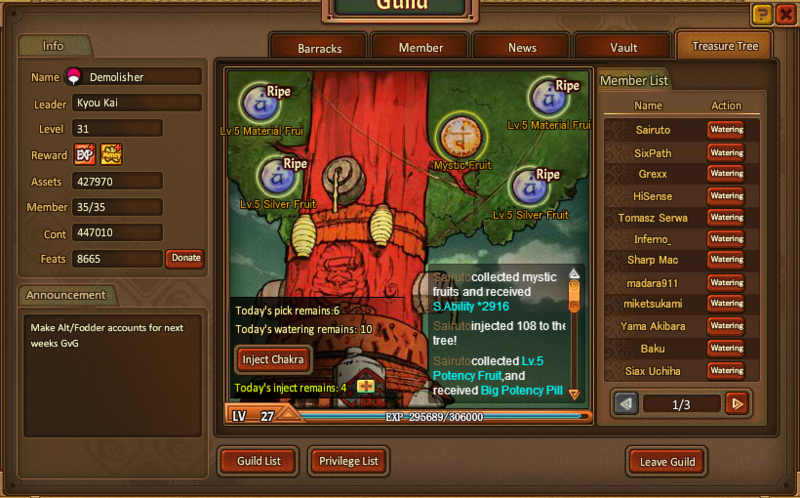 What exactly is a guild? A guild is typically an in-game association of player characters. In our case, ninjas! It's a place where you get bonus benifits in game. It's a place where you can look for help. It's a place where you can make friends. Click that and you'll be able to choose between searching for a guild or making your own! Note, the guild will be for the same clan you chose. For example, I chose Uchiha, my guild is a part of the Uchiha clan. 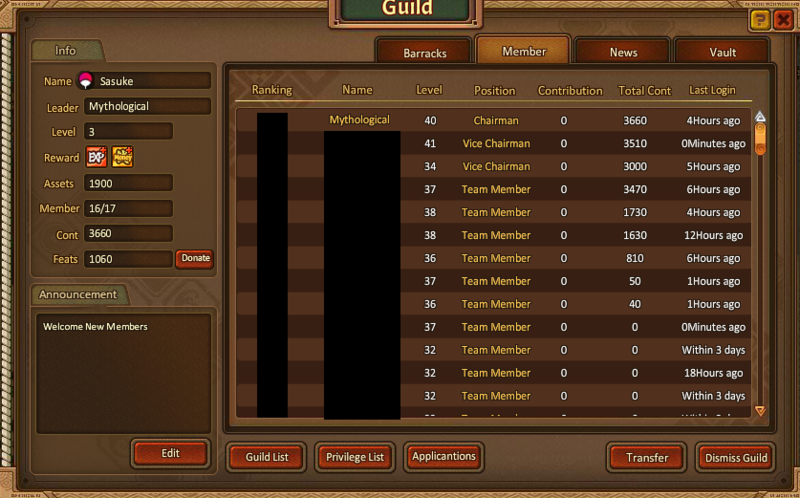 This rank is given to the person who created the guild. if you do not log in more than 3 days, the Vice Chairman who contributed most will become Chairman! This previlege is given to the person/people who have donated most. This is very important! With out this, guilds will not be able to upgrade! When you donate it gives the guild "Assets" and gives the person donating "Feats". Assets are points used to upgrade(level up) things in the barracks. Upgrades are really important to a guild. It makes the guild stronger and upgrading benefits the members also. As a guild leader, when obtaining enough Assets, you can upgrade you guild. You have 3 options to use it on. This is the most important one! The Guild Camp is what levels your guild up. 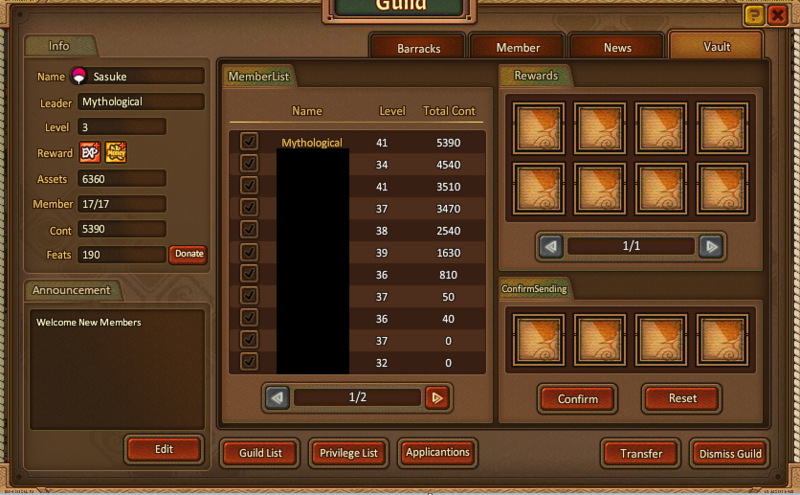 As you can see in the picture, this guild is level 3. 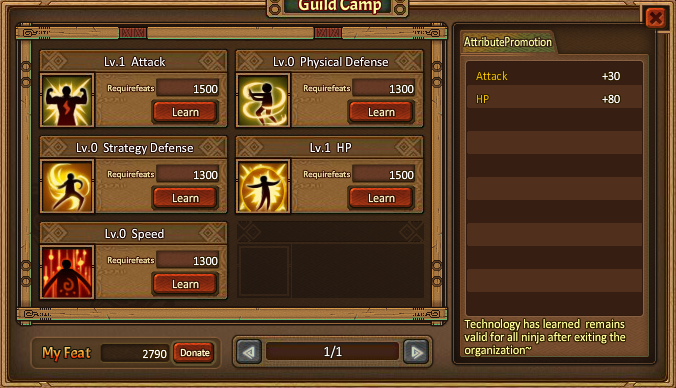 When you level Guild Camp up, it allows you to buy more attribute promotions which uses Feats. The guild here is level 3, which means im only able to level up these attributes to level 3. 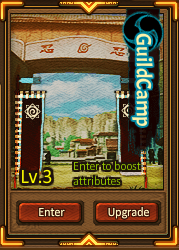 Higher level guild camp = higher level cap on attribute promotion. Each level you get more of a boost. My guild is level 4, we have 1.5% boost for each. stronger during the conquest by giving them attack bonuses. These are mini games that guilds can participate in. 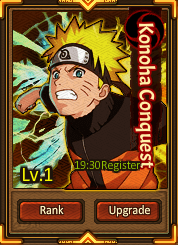 You can only join defence if you placed top 10 in conquest. After the mini game is over, the top 10 guilds get Guild Chests as rewards. 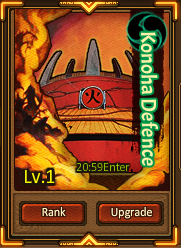 The top 10 guilds move on to Konoha Defense. 4 guilds will get chests. This is where your rewards will be placed when you win them! After accepting the awards you're able to send them to whomever you like. Thank you for reading! If you have anything to add or I got something wrong let me know. Also make sure to check my next post because the guide continues! Amazing guide. Alot of people skip out on donating but those boosts help alot later on. Personally, as of right now the rewards aren't worth the 200 Gold (not coupons) you have to spend to fight the beast. If you're still interested here's how to fight the beast. 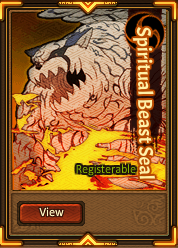 You need 5 members of your guild to register during 7:00-12:30 / 14:00-19:00 server time before you get the option to pay for the the summon. Once the button is visable, the person with the 200 gold clicks it and confirms if s/he wants to spend it and then you're able to join. Rewards are shown in the picture above, good luck! Every day you get a chance of picking fruit which allows you to get different rewards. Injecting Chakra (Watering) into the tree gives you feats and increases the tree's EXP. The higher the tree's level, the more EXP/Silver/S.Ablility you get from the fruits. You can pick 1 Mystic fruit each time it's ripe, there's no cap on how many you can pick a day. Your screenshots will undoubtedly help a lot, nice addition. Yes I usually made picturesque/graphic guides on many mmorg sites because I am disabled that I use American sign language with no grammars. I can understand how foreign even disabled players in the internet world felt when they had a difficult time to learn anything from any text guides. Very cool guide, but its a small minor detail but 4 guilds get chests in KD, The defender also gets chests, when they lose they get 5 like they got 4th, and 30 when they win. Updated stage xp/silver bonus per level under upgrades. Great guide, really helpful myth. thanks, im glad it helped. GMT-4, 2019-4-23 19:59 , Processed in 0.031610 second(s), 11 queries .